Cinema has always been fascinated with predicting the future. Hovercrafts and time travel are just a few of the frequent images we see in sci-fi films. In Spike Jonze's latest film "Her", futuristic technology is also at the forefront but it addresses conventional concerns that have been around since the dawn of man. As technology advances, the biggest societal change will be how we interact with each other. This theme is the thrust behind the plot of this uniquely original film. If you're familiar with the Bible, you know that according to its teachings the first woman came into being due to the loneliness of the original man, Adam. Despite having everything he could possibly want, he longed for a companion. Such is the case with our protagonist Theodore (Joaquin Phoenix), a lonely man of the future who's life feels unfulfilled after a divorce. He has a reliable friend in the form of longtime fling Amy (a terrific Amy Adams) but it's not enough. In need of someone to endure the lonely nights and uneventful days, he signs up for a new product that can communicate like a human being. This operating system is called Samantha and she turns out to be every bit the engaging conversationalist he could have hoped for. You can probably guess where the plot goes from there, i.e. they fall in love. Over the course of the film, Theodore is reinvigorated, finding happiness once more. It's fascinating to watch, as his joy seems so genuine despite its "artificial" source. Admittedly, I found some of the serious relationship drama to be unintentionally funny. Yet Spike Jonze's script is always sincere. As you get to know the ever-evolving personality of Samantha, she becomes every bit as real as your traditional cinematic love interest. The only thing missing is a physical human form, a factor that is beautifully addressed in the film. Much of the suspension of disbelief in this relationship is due to the expressive voice work by Scarlett Johansson. She's an essential component of the film, giving a textured, nuanced performance that compliments the thoughtful screenplay. Joaquin Phoenix is surprisingly charming in his role but Johansson is the film's MVP in the acting department. Overall though, the best aspects of the film are undoubtedly Spike Jonze's directorial vision and astute script. He's able to purvey a mood that feels so delicate and pensive it makes you sit back and ponder the many themes and ideas explored in the film. Furthermore, the film benefits from Arcade Fire's soothing soundtrack and warmly lit cinematography. This all amounts to a film that is constantly sweet and lovely. It often felt a bit too "soft" in the way it presents its characters (there's a certain lack of palpable pain) but to disregard it on that basis would be to miss out on one of the smartest screenplays of the year. Even when the idea of a relationship with a computer seems strange, the world that gives rise to this technology feels so much like our own. Heck, people engage in "Catfish" romances every day with persons who effectively aren't real. Even outside of romance, our current technology can be so individualized that the technology depicted here seems entirely plausible. As I said in the introduction however, the film's sci-fi concept only lays the foundation for a story that is universal and timeless. The development of Theodore and Sam's relationship is no different from the experiences that most couples go through. Their journey is one of tremendous insight and I look forward to experiencing it again. 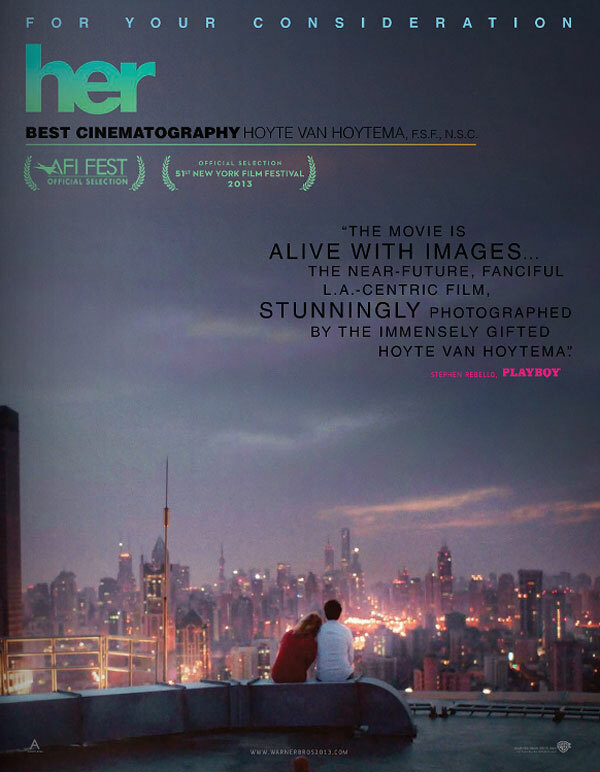 Spike Jonze has created one of the most graceful and thought-provoking romance films I have ever seen. Spike Jonze's films usually attract some amount of Oscar attention, but I think this may be his first shot at Best Picture. It's such a memorable film that it's sure to have many champions within the Academy. I'm also very confident in the film's chances in Best Original Screenplay. Less certain but also possible is a nod for Best Director. It's a very competitive field, but he's surely in the mix. Finally, there could be a history-making nomination if Scarlett Johansson manages to land a nod for Best Supporting Actress. I remain skeptical but she's good enough that we may be in for a surprise come Oscar morning. it is very sweet and very emotionally raw and brutal at times. so amazing. and i really think we are closer to this era than we may think. many of the themes in the movie we are already facing today. I'm not sure what just happened. This film hits me on an emotional level I can't even put into words. Now I find myself wondering what the future of technology may hold. Perhaps a deep relationship one could only find with intimate prayer to their God. Map: Google Maps/Sanborn. First explosion: John Tlumacki/The Boston Globe/Getty Images. Two young men later identified as Tamerlan Tsarnaev, 26, and 19 year old Dzhokhar Tsarnaev, by law enforcement officials are seen turning onto Boylston Street from Gloucester Street, according to a criminal complaint and affidavit filed by FBI special agent Daniel Genck. In season 1, there the scene where Ned Stark has to kill one of migos shirt the direwolves, and there was an outrage how can you show the killing of a direwolf? Which is funny in itself because it doesn exist, it a fantasy animal. No one mentioned the scene after you see the Hound riding to town with a dead boy draped over his horse. No one thought that was disgusting. She never shied away from doing anything that was required to make her film the best. People talk of her running a fever while she was shooting for the song, Na Jaane Kahan Se Aayi Hai, for Chaalbaaz (1989). Though donut shirt I don remember that, I was with her at Filmistan Studios when she shot for Kaate Nahin Kat Te (Mr India, 1987). Powders tend to sit on top of the skin. I also avoid bronzers with shimmer for the face. If glow is what you're after, use your shimmer just on top of cheekbones for a little kick, or keep shimmer to the body." Sage Maitri, Los Angeles based makeup artist who has worked with Rashida Jones and Kaley Cuoco. It appalling that after 3 years more reporting hasn been done on nice shirts this story. You know there are other of horror out there just like this one. What happened to the officials that should have shut this place down? Do they still have jobs? Have processes been changed to ensure it doesn happen again? And what about those who worked for the doctor all of those years; will they face punishment? And what about the women who were damaged? There are SO MANY aspects of this that need to be reported IN DEPTH to ensure it doesn continue to happen all across the country. Promises have always been made, but the reality has remained different regardless of which party has been in power. In keeping with successive government representatives, the current petroleum minister, Ghulam Sarwar Khan, also chose last week to deny the existence of gas loadshedding in the country. Gas supply will be curtained to the CNG and captive power sector. Belgium's soccer dinosaur shirt transformation is the most talked about revitalization program in the game. A grass roots transformation began in the early 2000s, with an emphasis on technical skills and nationwide youth development. This coincided with a national program to use soccer to help integrate recent migrants. Finally, I decided that I at least would like to see those bastards. I heard feet on the loose stones of the dirt on the tarmac and a shotgun went off. More steps and the shotgun went off again. Before 2015, Nassau's North Shore had never seen a Chinese restaurant anything like Beijing House. The small, L shaped dining room looked like scores of others, but the bustling kitchen was putting out seaweed and slow cooked pork spare rib bone soup, stir fried quail with cumin seed, soft fried boneless spare rib with salt and pepper, braised pig feet in brown sauce, stir fried pork intestine. Local Chinese families showed up in droves and, gradually, curious and adventurous non Chinese have joined in.